Biomass resources and their refining are key research topics internationally as alternatives to fossil fuel resources and oil refining. This book explores the heterogeneous nature of lignocellulosic biomass, which restricts its use as a raw material, and describes the theoretical basis of the lignocellulose refinery. It puts forward the theory of the integrated biomass refinery system, which produces multiple products, including biofuels, biomaterials, biochemicals, food and feed based on careful fractionation of the raw material. Chapter 1 introduces the significance and development of lignocellulose biorefining. 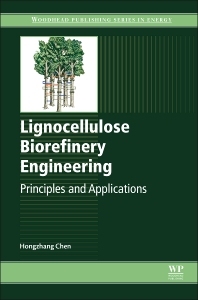 Chapter 2 gives the theoretical basis of lignocellulose biorefinery engineering. Chapters 3 to 6 describe in detail biomass refinery engineering from the perspectives of feedstocks, conversions, products and processes respectively. Models of integrated industrial biomass refinery chains are presented in Chapter 7. Finally, Chapter 8 considers future trends in lignocellulose biorefining. Biorefinery engineers, industrial chemists and biochemists will all find Lignocellulose Biorefinery Engineering an indispensable reference book. It will also be useful to academics from postgraduate level upwards with an interest in biomass and biorefineries. Hongzhang Chen is a professor at the State Key Laboratory of Biochemical Engineering, Institute of Process Engineering, Chinese Academy of Sciences.